Stephen F. Austin State University graduate student Kyle Thoreson is seeking to make Oklahoma State Parks available to everyone through 360 video and virtual technology. Thoreson, pursuing a Master of Science in resource communications, is collecting 360 video at select Oklahoma State Parks as part of a pilot project to reach individuals unable to physically visit the parks. Thoreson hopes to expand the initiative using immersive virtual reality suites. 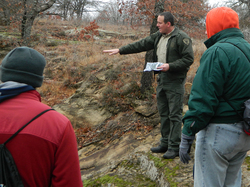 Pictured, Thoreson, a park ranger at Oklahoma's Osage Hills State Park, addresses visitors during an interpretive hike. NACOGDOCHES, Texas - The Oklahoma State Park system encompasses diverse landscapes ranging from subterranean caverns to rolling mountains. However, of the more than 55,000 acres that comprise the state park system, some of the most spectacular, scenic vistas are not accessible to those with health or mobility limitations. When contemplating topics for his final nonthesis project, Thoreson said he researched the growing popularity of 360 videos and how this technology can be utilized to share Oklahoma's state parks with everyone. "For example, to get to the best vantage point of the falls at Natural Falls State Park, you have to go down to the very bottom so you're looking up at the falls," Thoreson said. "We have sort of a skyway that goes out and gives you a view from part of the way down, but it's just not the same as being below the falls." "We have to determine what things different demographics want to see and ensure it is speaking to their emotional health." "They can put on a viewer in the comfort of home to experience the park," Thoreson said. "It's a driving interest of mine - to be sure I can take the parks to the people." To learn more about this and other research, visit atcofa.sfasu.edu.